Well, I did a little blog hopping… like ya do… and delved a bit into the cauliflower-pizza lore out there. Yep, there it was, sprouting up all over the blogosphere along with myriad gorgeous pics of thin-crust pizzas. Many of the bloggers out there even admit their initial skepticism before stunning pizza-y success. Still, I just couldn’t buy into it. Isn’t pizza all about that carby goodness? And besides, how could I jump onto the bandwagon a bazillion other food blogs were already riding? …I thought, right before removing my Hipster-Bans and realizing it wasn’t about the pizza or trendy dieters. 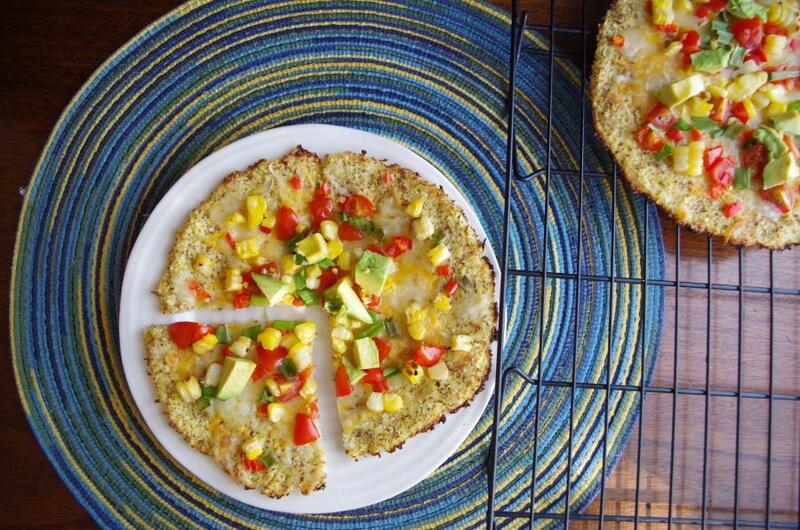 The cauliflower crust means something new entirely. It means that what we thought we needed to form a cohesive, chewy crust, may only be one of many options. It means that a lowly vegetable primarily found in freezer-bag mixes and your great-aunt’s cooking has made a red-carpet comeback. And, it means that even we of the not-so-trendy, what’s-a-diet-anyway crowd, can also try an alternative and edgy eat… and just enjoy it. So, when I put together this scrumptious crust for myself, I acknowledged the low-cal, low-carb, gluten-free aspects of it… and focused on the enjoyment instead. Yeah, this crust can actually taste good. Thanks for the tip, Mom! Also, it doesn’t have to make a pizza. I set out to make a pizza crust and ended up with a tostada. Like… a Mexican-style pizza! There is cheese in all the right places, delicious and beautiful things on top, and that is all that matters. So, now I would say cheers and toast to our health and happiness… but I’m digging into this delicious dish here. Let’s just pretend we clinked glasses, okay? In a food processor, pulse the chopped cauliflower until it takes on a grainy texture. Many people liken this to rice, but it seems to come out looking more like couscous or cooked quinoa. Move the cauliflower “couscous” to a cheese cloth to squeeze out any extra moisture. I used paper towels the first time, and ended up going through most of a roll! The cauliflower is very moist, so the more water you can extract from it, the better. A little moisture left in will result in a soft tortilla-like texture. Not a bad thing, of course, but if you want a crispier crust, less moisture is better. 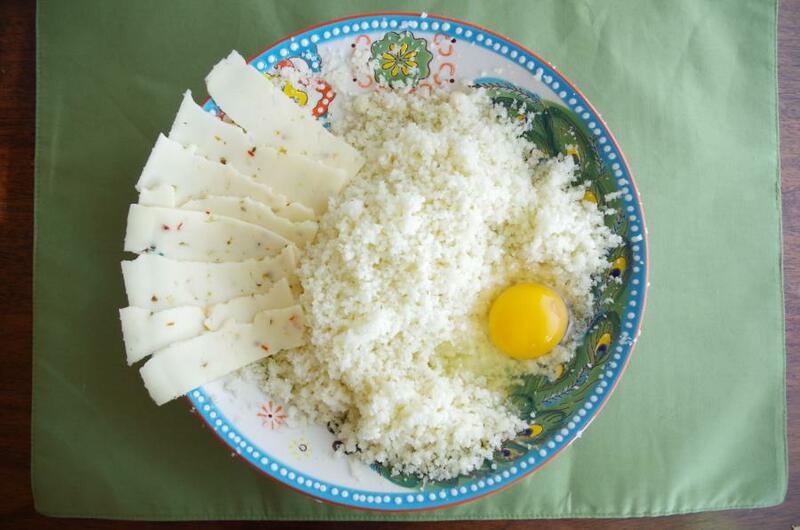 Mix the remaining cauliflower with the egg, flaxseed, cheese, and seasonings. The cauliflower doesn’t have much flavor on its own, so making sure to season it properly is a must! On a sheet pan covered with cooking-sprayed parchment paper, mold the cauliflower “dough” into three or four 8” rounds. Press them down evenly, making them about 1/8” thick. Bake the rounds 15 minutes, or longer, depending on your crispiness-preference. Remove the baking sheets, top with all toppings except avocado and cilantro, and place under the broiler 1-3 minutes, or until the cheese is melted and slightly browned.